Imaginative set of puzzles for 2-5 year olds! 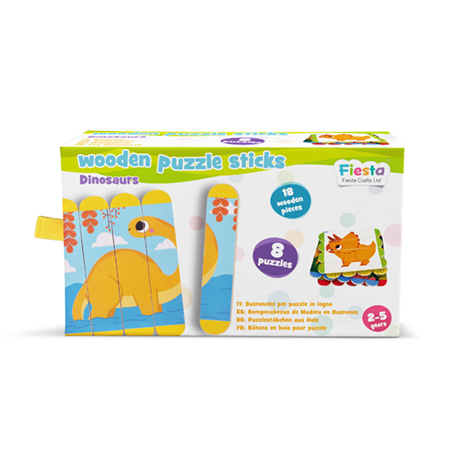 Put together and find 8 puzzles with these exciting dinosaur-themed wooden Puzzle Sticks! There are 18 double sided wooden sticks which make up the 8 different puzzles, 4 of which use 4 sticks and 4 using 5 sticks. Children will enjoy the activity of playing around to find the right order of the sticks to make up the final colourful images. This activity is also ideal for developing motor skills, as well as useful matching skills. The pieces are stored in an attractive storage box which is perfect for providing travel entertainment on the go. 8 puzzles per set - keeps children really engaged. Easy for youngest children to play and develop matching and motor skills.